In 1987 our 1st President was Ian Cooper and the Clubs Honour Board reflects the past and present committee. Our club has 5 life members with Phil Gue being our 1st Patron (2004-09) and Beryl Ey (founding member is our current Patron. In memory of our past members, players compete for several trophies during the year including: John Chambers,Lois Duke and Alan Bruer cups. Our club holds 2 Congress per year (Autumn Pairs and Winter Teams Event ) and both Congress well supported along with inter-club challenges. We are affiliated with ABF and masterpoints allocated accordingly. We are using Bridgemate to score our weekly evening and day sessions, and a dealing machine for our boards create competitive play. 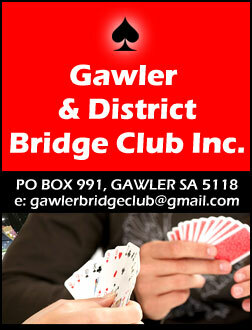 The Gawler Bridge Club committee strongly endorse the encouragement of attracting new members to our club. Bridge Training Courses are continually being held throughout the year and a strong emphasis is placed on advertising our clubs activities. 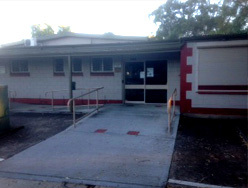 Peruse our Web Site to find more details about: membership fees: table fees: session times: years program (green,red & gold points) including Congress details along with contact and venue information.